The machine, paired with Evac’s mixed-waste macerator, can create dry briquettes of waste that can be stored when a ship may not use its incinerator, the garbage room will be filled floor to ceiling in two days,” says Jari Jokela, PhD, Evac Senior Process Specialist. It is estimated that the space savings translate to for landing or incinerated at sea. “In an environment a dramatic 25 per cent reduction in operating costs when compared to incineration where diesel and energy consumption is considered. Jokela says inspiration for the technology came from witnessing how sawmills were creating briquettes. 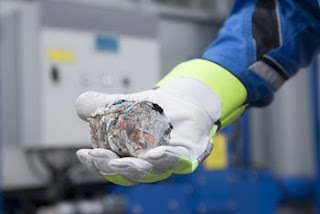 Evac created a similar technology, in a much more compact form, for use orkers and a reduced volume of garbage would mean fewer trips to remove waste from the platform. at sea. The technology could also be used on offshore oil platforms as they are typically staffed by up to 1,000 w.